The OECD Model Tax Convention seminar is a regular feature of the annual IFA Congress. 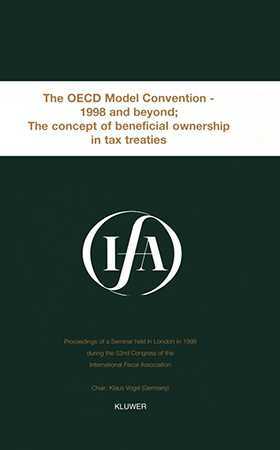 At the 1998 Congress, held in London, the seminar focused on the relationship between tax treaties and domestic laws in OECD member countries. After general surveys by two high-ranking OECD officials of relevant issues and developments in the Working Groups of the OECD's Committee of Fiscal Affairs during the course of the preceding year, the 1998 seminar offered two topics--on the concept of beneficial ownership, and on the characterization of retirement income--which were opened for discussion among panelists and attendees. The discussion shed significant light on the inter-relatedness of cross-border pensions, deferred compensation, and anti-abuse provisions as they appear in bilateral tax treaties, domestic laws, and the Model Convention. This handy volume reprints in full all the papers presented at this important seminar, along with the subsequent discussions. Practitioners and academics interested in the development and application of the OECD Model Tax Convention will appreciate its valuable insights.